Enjoy the waters of Lake Minnetonka on a pontoon! Rent your pontoon today at Metro Lakes Marina & Rentals LLC. Rent a pontoon by the hour for a short boat ride with customers or rent one all day with family and friends. We are very flexible and will be able to accommodate to each customer. Our 22-25 Foot Pontoon boats can accommodate 10-12 people – Each rental includes life jackets for every passenger, instruction on how to operate the boat and a Map of Lake Minnetonka including an instructional buoy map. Enjoy Lake Minnetonka at it finest on one of our 22 Foot Pontoon Boats. Enjoy a comfortable cruise around the lake with friends and family or stop by the some of the known hot party spots on the lake like BIG ISLAND. Our 22 Foot Pontoon boats can accommodate up to 10 people – All packages include life jackets for every passenger, instruction on how to operate the boat and a Map of Lake Minnetonka including an instructional buoy map. 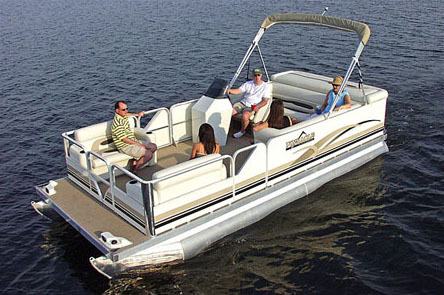 Upgrade to one of the larger 25 Foot Pontoon Boats that can accommodate up to 12 Passengers. Captain you boat to some of the finer restaurants on the lake, like Lord Fletchers in Navarre or Bayside and Manards located in Excelsior on the south east side of the lake. Must be 18 years of age with valid driver's license to rent or drive Pontoon, Wave Runner, and Fishing Boat. Reservations with major credit cards only (VISA - MasterCard - Discover). You must bring your credit card with you on the day of the rental. Debit Cards Not Accepted. Must sign a Pontoon / Fishing Boat / Wave Runner / Paddle Board Lease Agreement at the time of your rental. Customer will be responsible for damages to, or losses, of all rental equipment. A damage deposit of $500 for Wave Runner Rentals will be preauthorized on your credit card upon check-in. This must be on a Credit Card - NO CASH OR CHECK for damage deposit. No glass or kegs allowed. Alcoholic beverages in other containers are acceptable. Please make arrangements for a designated driver. No cancellations within 3 days of rental date. We allow weather related cancellations on the day of rental only (rain, extreme high winds 30mph+) and will call you if your reservation requires cancellation. If a reservation is cancelled within the 3 day time frame a $100 cancellation fee will be charged. If you fail to notify Metro Lakes Marina of cancellation the full rental fee will be charged against the credit card on file. © 2019 Metro Lakes Marina and Rentals. All rights reserved.